I decided to write this book while trying to learn more on Fortran during a NASA competition that is calling for developers to optimise some of their simulation code for the Kepler supercomputer. If you are like me and want to learn by example, experimentation, creation of some software that can run immediately and start to drool at the idea of writing code in any way or format you are in the right place. 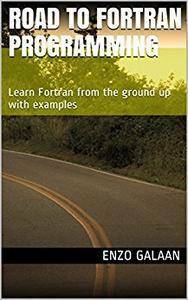 Based on Fortran 90/95/2003 and what is supported by the gfortran suite, we go through a few basic examples in order to get familiar with this high performance programming language.